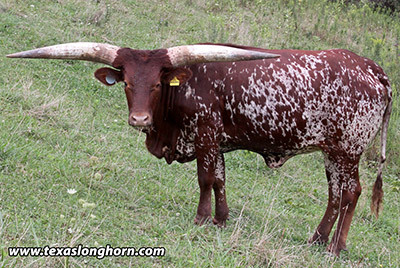 Kigoma She is 3/4 Watusi of the highest quality lineage and 1/4 Texas Longhorn. She will brighten a pasture. Although elgible to register at a 3/4 WWA Watusi, sells unregistered. Preg check pos to Titan Wolf (horns wide enough to reach two counties) Test neg Johne's.